From rolling hills dotted with sagebrush, a piece of the South County was first claimed in 1867 as part of 8,838 acres secured under a U.S. land grant by Isaac J. Sparks, who named it El Pizmo Rancho. 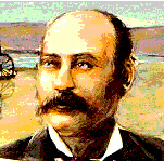 It was Sparks who first set out to develop the area, but when he sold half of the property 20 years later, it was Dwight William (D.W.) Grover who took advantage of the California land rush and began in earnest to try to transform sagebrush into stagecoaches. It was D.W. Grover, legend goes, who first recognized the potential of the area that is now Grover Beach. On August 1, 1887, he filed plans at the San Luis Obispo County Court House and founded what would become the City of Grover City. The 35-year-old lumber man from Santa Cruz is said to have paid $22,982.20 in gold to John Michael Price, the founder of Pismo Beach. Mr. Grover thus founded The Town of Grover and he had a vision of a community that included a hotel and railroad station near the beach and promoted his town as "the place where the tide lands and the rails meet." In the 1890s, Mr. Grover attempted to have a train station built in the Town of Grover to attract tourists and investors. Unfortunately for the Town of Grover, Southern Pacific constructed the sought-after station in nearby Oceano, an unincorporated town in San Luis Obispo County. D.W. Grover laid out streets in a grid pattern, naming them for popular beaches of the time, and set aside land for a train depot, a hotel, and a city park, hoping to foster commercial growth. A land auction on August 1, 1887, drew more than 1,000 people to look and perhaps buy. Grover and his partner, George Gates, promoted Grover City as the "grandest summer and winter seaside resort on the Pacific Coast." Over the ensuing years, D.W. Grover made numerous attempts at making his city a reality and the cause of the city bearing his name would be picked up by other men. The seeds of development didn't flourish as planned until many years later when Horace V. Bagwell came north in 1935 and bought about 1,100 acres. He advertised Grover City as the "home of the average man," with land prices in the working man's range. Word began to spread and so did development. In the mid-1940s, the first store opened followed by the first post office. The year of 1949 saw the Fairgrove Fire District and the Grover City Water District formed, and the early 1950s brought a building boom. The little town grew in numbers and progressed in development until in 1959 the majority of residents wanted to make the "city" a reality. An incorporation election was held and on December 21, 1959, found 636 of 1,900 registered voters in favor of and 380 against making the Town of Grover a city. The first mayor of the new Grover City was Fay Keen, and the City Council met for the first time on December 28, 1959, at the Fire House at Ninth Street and Ramona Avenue, where the first City Hall would be located. As the city boundaries were laid out shortly after incorporation, the groundwork was also laid for more growth and development. The city grew steadily in the decades to follow, and in the mid-1970s, development took off as vacant lots were replaced with restaurants, markets, and residences. A point of argument in 1959, according to newspaper accounts of the time, was whether naming the city the "City of Grover City" was redundant. Some moved for a new, more ocean-oriented name. In 1992, the question was revisited when city residents voted 2,300 to 2,201 to turn "Grover City" into "Grover Beach," reaffirming the City Council's vote to change the name by ordinance. Since D.W. Grover first envisioned a city through the tall weeds, the city that bears his name has grown and changed with the times. The city now has a population of 13,438 residents (as of January 2017) and Mr. Grover's dream of a train station became a reality in November 1996 when Amtrak began rail service with two daily stops at a newly constructed train station at 150 Grand Avenue on the Pacific Coast Highway. Some say D.W. Grover was just a developer who came in to strike a fortune. There were others who lent a hand along the path to development. But somewhere along the line, a city was born!